Thanks to Rob Briggs and his support runners Steph Porter, Mel Irvine and Aaron Goulding yesterday for an EXCELLENT job promoting our upcoming marathon. 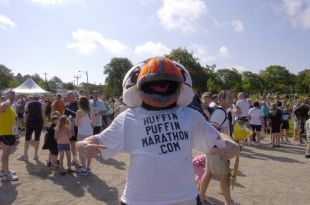 Rob ran the entire Tely 10 donning a hot and heavy puffin costume. The Telegram snagged him at the finish line and published THIS STORY.